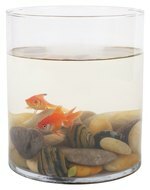 Can I Use Distilled Drinking Water in My Fish Tank? 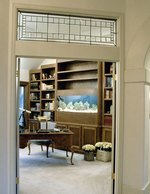 Fish tanks and aquariums house many different kinds of fish in a variety of environments. Fish tanks and aquariums should not traditionally be filled with distilled water because many minerals are removed from it. Although generally not recommended, it is admissible to combine fresh water with a small amount of distilled water to create an ideal environment in which fish can thrive. Distilled water is a type of water that is produced by distillation, which is heating the water, letting it boil, and waiting till it turns into steam. The water is then cooled at a cold temperature, which condenses it back into water. The result is a purified form of water that removes minerals like iron and calcium, and is free of gases and potential contaminants. Distilled water is composed of oxygen and hydrogen molecules, with a pH level of 7. Distilled water also has a blander taste than regular water because its minerals have been removed. Fish tanks should not be filled with distilled water because the minerals are removed from it. Minerals such as iron and calcium help the fish thrive. In addition, because fish have semi-permeable membranes, fish can experience deadly trauma in pure, distilled water. Betta fish are especially susceptible to trauma when placed in tanks with solely distilled water. Although it is recommended that distilled water should not be used, a small amount can occasionally be used to top off the tank. Yet, if there is only distilled water on hand, minerals must be deposited in it to keep the fish healthy. It is recommended that purified mineral water be used instead of distilled water. Alternatively, tap water can be used, but it must be treated to remove chemicals that are potentially toxic to fish. Chlorine or chloramine is often added to tap water as a purifier, but such chemicals can damage the gills of fish. Therefore, tap water can be tested for high levels of chemicals. If the water is chemically laden, it can be treated with a water conditioner, which detoxifies heavy metals by allowing the metals to precipitate to allow their removal by filtration. A fish's tank should ideally have a filtration system attached so it can periodically clean the water of impurities. If there is no filtration device, the tank must be cleaned once a week. Make sure the temperature of the water is room temperature, not too cold or too hot. A pH test is also recommended to make sure the water does not have a pH that is too high or too low; a neutral pH of 7.0 is ideal.